This article was originally published in the North Island Gazette on January 30, 2014. Many people from Northern Vancouver Island have likely heard of the World’s Fair, or perhaps attended Expo ’86 in Vancouver. The North Island and many of its community members have an interesting link to one specific historical World’s Fair, of which many people may not be aware. This connection happened during Chicago World’s Fair in 1893 and resulted in the attraction of many of the first non-First Nations settlers to this area. In the mid 1800s the Hudson’s Bay Company built Fort Rupert at Beaver Harbour on the North Island. Due to the isolation and late settlement of the northwest coast, the First Nations of the area were considered to be relatively ‘untouched’ by European culture. 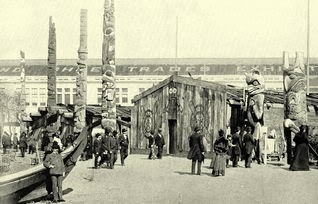 In order to show off this unique and interesting culture to the rest of the world, an entire Kwakiutl village site was re-constructed in Chicago for the World’s Fair. Big houses were relocated to Chicago from Northern Vancouver Island, along with a large number of totem poles, local ceremonial items, and artifacts. Seventeen Kwakuitl band members (fifteen adults and two children) wearing traditional cedar robes, and other historic paraphernalia, were also a part of the display. The Kwakiutl display attracted a lot of interest and attention. The souvenir book said that the Indians in their reconstructed village would : " live under normal conditions in their natural habitations during the six months of the Exposition." The First Nations put on displays of singing and dancing for visitors, some of which were recorded. When the Fair ended the First Nations returned home, but many of the artifacts which had been shipped to Chicago were sold to a local museum. The Chicago World's Fair was a huge success, with over 27 million visits recorded, at a time when the entire population of the USA was only about 65 million people. On one day over 750,000 people attended. Many of the North Island’s first white settlers were lured to the area after hearing the stunning reports of its beauty and richness at the World’s Fair. Stereoscope postcard of the Kwakiutl village at the fair. Alexander Lyon was intrigued by the Kwakiutl exhibit, and moved to Fort Rupert. He married Sarah Hunt, one of Robert Hunt’s daughters (Hunt worked for the HBC and bought out the fort when the HBC decided to close it). They started a trading post in Hardy Bay. Harry Cadwallader was a guard at the fair, and also was interested enough by what he saw there to travel back to the North Island. He met and married Jane Charity Hunt, another of Robert’s daughters. A number of Quatsino settlers were also lured by the Chicago display. Christain Nordstrom, Edyius Evansen, Halver Bergh, Ole Skarberb (Sherberg) and about five others decided to relocate to the area.